When you want to capture those punchy thumps and critical bass lines, turn to the Shure Beta 52A as your recording weapon of choice. Designed specifically for use on kick drums and other bass-heavy instruments, the dynamic Beta 52A microphone offers a low-end-loving frequency response, incredibly high 174 dB SPL handling, a modified supercardioid pickup pattern, and more. Take this hardy mic on tour for Shure-quality sound every time you perform. Your kick drums and bass instruments will thank you when you introduce Shure's Beta 52A to your setup. A frequency response of 20 Hz to 10 kHz allows the high-output dynamic microphone to convey the true punch and attack of kicks and bass instruments, while its supercardioid pattern ensures that you hear exactly what's placed in front of the mic, and nothing else. High gain before feedback and excellent rejection of unwanted sound are just a couple of the highlights you'll get to know when you work with a supercardioid microphone like the Beta 52A. With Shure's Beta 52A, setup happens in a matter of seconds. A built-in dynamic locking stand adapter with an integral XLR connector makes installation a breeze, especially when placing the mic inside a kick drum or in another difficult to reach space. The mic performs as it should no matter what, thanks to a hardened steel mesh grille that protects sensitive internal circuitry from all the wear and tear that comes with touring and gigging. The Beta 52A's innovative stand adapter keeps the microphone in place so that during a live show, you can play as aggressively as you want without having to worry about screwing up your tech's perfect positioning. The stand adapter works in concert with a pneumatic shock mount system to keep the mic fully functional even when it's subjected to sharp blows, vibrations, and other unwanted noises or assaults. - Certification: Eligible to bear CE Marking. Conforms to European EMC Directive 89/336/EEC. Meets applicable tests and performance criteria in European Standard EN55103 (1996) parts 1 and 2, for residential (E1) and light industrial (E2) environments. The Shure Beta 52A is a high output dynamic microphone with a tailored frequency response designed specifically for kick drums and other bass instruments. It provides superb attack and 'punch', and delivers studio quality sound even at extremely high sound pressure levels. The Beta 52A features a modified supercardioid pattern throughout its frequency range to insure high gain before feedback and excellent rejection of unwanted sound. A built-in dynamic locking stand adapter with an integral XLR connector simplifies installation, particularly if the microphone is to be placed inside a kick drum. The stand adapter keeps the microphone position fixed and resists slipping, even when subjected to sharp blows and strong vibrations. A hardened steel mesh grille protects the Beta 52A from the abuse and wear associated with touring. Sound: Thicker and more responsive my AKG D112 it works great for a solid low-end boom. Feature: They could have included a nice case. Quality: Great quality! a big sturdy all-metal mic that is impossible to break and sounds great. Value: This mic is cheap as well as indespensible for drums. Manufacturer Support: Haven't needed support. The Wow Factor: It does look pretty cool. Overall: It's definately my favorite kick drum mic. Sound: Honestly, with a little EQ you can get any sound you are looking for out of this mic, and who in their right mond isnt using EQ? By itself, the low end is great, Mids are all there, and highs are clean and clear. I record mostly Metal and hard rock. So I'm looking for slight "woof", heavy punch, and loud attack. I can get that and more out of this mic. Feature: Between all the kick mics in this price range, I don't see any HUGE difference. But, I personally went with the Beta52a because it's the only one with a supercardioid pickup pattern. So this mic rejects unwanted sound BETTER than all the others... I do wish it had a nice case, the bag is kinda lame. Ease of Use: How hard is it to use a kick mic? Plug it in, & put it in the desired spot you want in your kick, or in the sound hole... Quality: Yeah it's good quality, it's made out of metal... No cheap plastic here... Value: Like I was saying, it's the only one in the price range to have a supercardioid pattern, it dosent "cut" any frequencies you may want when using it in other applications like for a bass cab or even a guitar cab. 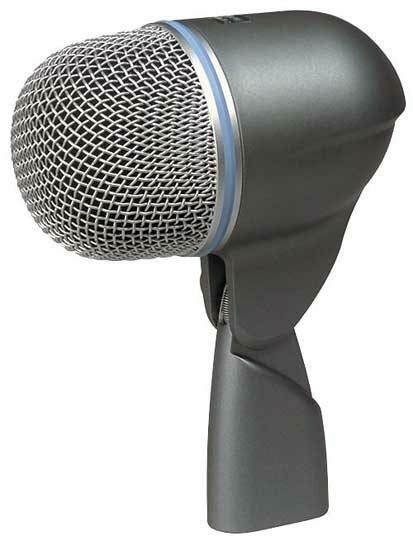 (as strange as that sounds) It's sturdy metal, and it's slightly cheaper than the other mics in it's price range. Manufacturer Support: I couldnt tell you man, I haven't needed any. The Wow Factor: Yeah I want it, I bought it diddn't I? Overall: This mic is a swiss army knife of a mic, You could say its a "swiss army mic". It can be used for just about anything, and it sounds great. Just USE YOUR EQ PEOPLE!!! 9 of 11 people (81.82%) found this review helpful. Did you?